Once A Month, I Have A Secret! And no, it's not about my period! *laughs* Well, closed enough though! I break out once a month and my skin goes bonkers! Funny how I never get that when I was younger, but now that I'm older, my hormones are like from that of a teenager! You probably think I don't break out, you're wrong! I'm just good at hiding them and most of the time, I'm working from home so I don't show to the world the bad skin stage! One of my ultimate secret that I've shared in this blog so many times is the use of The Body Shop Tea Tree Oil to spot heal! But, there will always be days you just can't understand your skin anymore! That's when I whip out my Leaders Insolution AC-Dressing Skin Clinic Mask! Now what does an AC-Dressing mask do? It can relieve troubled and sensitive skin, supplies moisture to the skin and lightens acne marks. It also has sebum control, helps clear dead skin cell and reduce minor scars of troubled spots. 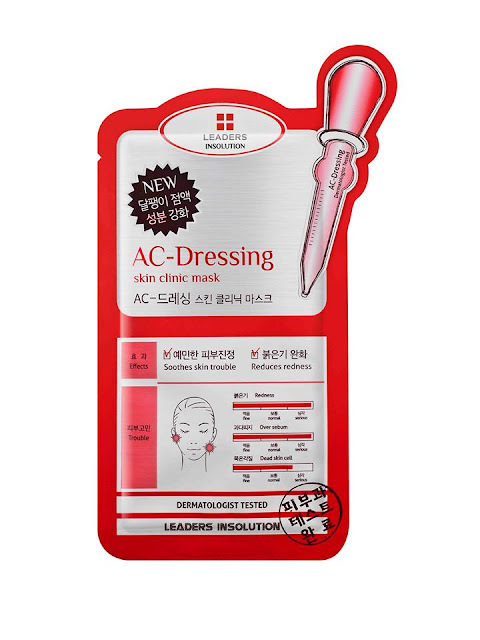 The AC-dressing has an active ingredient of a Snail Secretion Filtrate. Sounds gross but it doesn't hurt if it works! Whenever my hormones start to act up and my skin turns from dry to combination (dry and oily), I use an AC-Dressing mask leaving it for 15-20 minutes before I go to bed and wake up lesser redness! An added point is that, my skin looks hydrated and healthier. YES, even on first use, I can see results! Thankfully, Leaders Insolution is a dermatologists brand, they are made even for the most sensitive skin so I'm happy to report that I don't suffer any allergic reactions! My skin is quite sensitive and most of the time, skin care products meant to target skin issues are extremely drying and may cause my skin to break out even more! Not with the AC-Dressing so I'm making sure to grab this mask for my once-a-month trouble days! Leaders Insolution AC-Dressing Skin Clinic Mask costs Php148.00 / sheet. Available at Lucky Chinatown, Festival Mall, SM Makati Department Store, SM North EDSA Department Store, SM Manila Department Store, SM San Lazaro Department Store, SM Cubao Department Store, SM Cebu Department Store and SM Davao Department store. What do you do on days your skin is starting to act up? I don't if it's just me but I think leaders mask is small for my face it's "bitin"or it's just that I have a big face lol! I used to break out like everyday. Now, I don't anymore. My fave zit zapper is baking soda paste. It calms down the inflammation and reduces the redness. Tea tree oil never worked for me, but this mask sounds good. Love the nails BTW. The first sentence made me laugh, haha! I'd love to try this brand soon. I don't use face masks often, but when I do, I just love the feeling!